Learning to ride your bike is great fun, but keeping the bike safe and "mechanical free" is just as important. You don't really want a puncture to ruin a glorious ride, or a broken chain lead to a long walk home! Conor, our resident mechanical genius and grease monkey, can provide you with all the technical tuition you need. Each course consists of two 3 hour lessons and is held in Belfast. As each course requires a high level of tutor - pupil interaction numbers are limited to 5 people per course. Refreshments are provided all we ask is that you bring your own bikes. 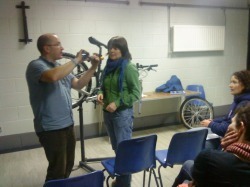 Just go to our Events Calender to check out where our next MTB Maintenance course is and BOOK NOW. For any personal tuition CONTACT US directly to arrange a day at a venue to suit you.